silver metal locking clasp. This necklace is very well made, not signed. beautiful 18" necklace justice. Three strands with silver metal catch stamped Japan. Wow. Pale copper glass and faux pearl beads accented with chains. The necklace is 14". Wonderful pastel green glass beads with crystal bead accents. The necklace is 18"
with silver metal clasp stamped Japan. strands, gold color clasp stamped Japan. Unusual purple glass bead with faux pearl & black crystal accent beads. The necklace is 18" with gold color clasp. teeny tiny and there are many strands. Turquoise seed beads and carved bone elephant in a very stylish 24" necklace. 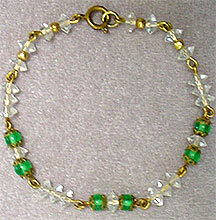 There are 26 strands of beads with silver metal cups and catch. 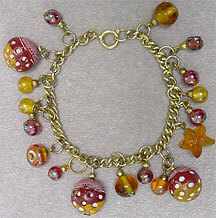 Cute glass and wood bead charm bracelet. 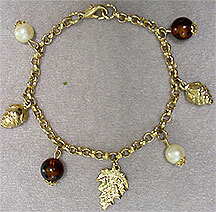 Pine cones and pearls make this a sweet charm bracelet. 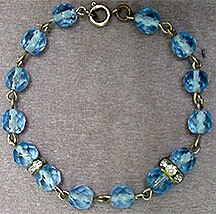 Blue crystal glass bead bracelet with rhinestones.